Evoluz Translation Services offers professional German translation services for English to German and German to English language combinations. We can also translate German into over 100 other languages. In fact, Evoluz Translation Services has pioneered to be one of the agencies in the industry to translate German to literally any language. Whatever your German translation requirement is, we are confident that our translation team is experienced and qualified to handle the project to your highest satisfaction. Your satisfaction is guaranteed as our German translators have the knowledge and expertise of using the appropriate terminologies needed for documents from different subject areas. We have excellent German project management team and quality assurance editors who can localize any content or document. Our Quality Managers are assigned specific projects as per their area of knowledge and experience. This will give you peace of mind as your documents are quality controlled by the best in the business. Variety of Services: Our other services in German to English language combination are German interpretation, voice-overs, transcriptions, and multilingual search engine optimization. German (Deutsch, [ˈdɔʏtʃ] (help•info)) is a West Germanic language, thus related to and classified alongside English and Dutch. It is one of the world's major languages and the most widely spoken first language in the European Union. Around the world, German is spoken by approximately 105 million native speakers and also by about 80 million non-native speakers. 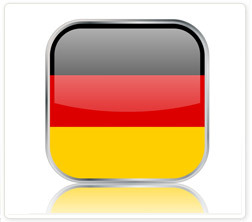 Standard German is widely taught in schools, universities and Goethe Institutes worldwide. Every 10th book published worldwide is in the German language! Due to its feudal history, unification, the and standardization of German language was not brought about till the 18th century when many outstanding writers (Goethe, Schiller,…) took great pains to form the language. Deference and politeness is expressed by the switch between formal 'Sie' (2nd person plural) and informal 'du' (2nd person singular). Written German uses several letters in addition to the 26 letters used in the English alphabet: a, o, u (called umlauts) and ?